Many herbal and plant-derived compounds show anti-cancer activity. Sadly, until someone figures out how to make the big drug pay day by changing them just enough to patent them, no one listens. This is especially true of doctors who forget that 90% of drugs come from “refinement” of natural sources and the other 10% that are computer modeled are usually found in nature soon after. I have written about Di Indole Methane and Sulforaphane extensively in the past. 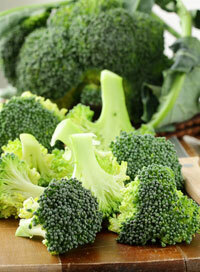 Both are present in therapeutic amounts in broccoli and Brassica vegetables. In addition, the Brassica family is one of the few vegetable families that have a balanced Omega6/3 ratio, making them even more attractive. Now there is a new kid on the block, from Broccoli and the like, called 4-methylthiobutyl isothiocyanate (MTBITC), and like Sulforaphane and Di Indole methane, it has potent anti-cancer activity. It works by damaging the DNA of cancer cells and it also turns down the telomerase in those cells, making them more susceptible to auto suicide and chemo agents. A couple of things: remember cancer is not a normal cell and that telomerase activation is often the last step in cancer. Next, remember cancer hijacks telomerase – telomerase does not “cause cancer”. Finally, remember the telomerase activator, TA-65, has been shown not to accelerate cancer transformation, or increase cancer risk. No other compound sold for human consumption has human data or cancer data either. So if you are swallowing something other than TA-65 that claims to be a telomerase activator, get the company that makes it to show you how they tested for cancer! You will not get a reply! Now here is a speculative but worthwhile thing: Eating Brassica vegetables may have an anti-cancer effect as well as a hormone balancing effect. No one is going to study this again since the “Big Drug Company Pay Day” doesn’t come from food. It happened to fish oil as there are now three “drugs” that are essentially fish oil on the market. I wonder if the broccoli-derived drugs will be in green capsules. Telomere maintenance – We who are about to die Salute You Fat from conception – stacking the deck against little Johnny!